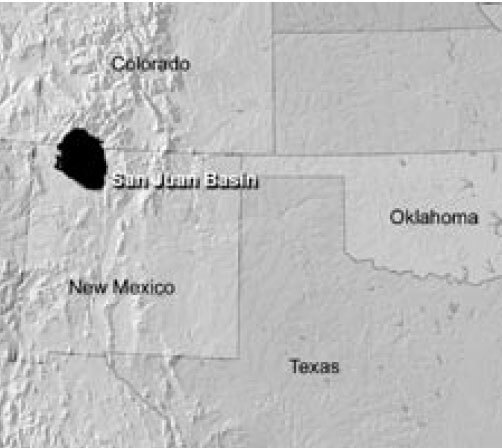 The hadrosaur fossils were found on the western edge of the San Juan Basin, shown in black. Evolutionary scientists have proclaimed for years that the dinosaurs died out at the end of the Cretaceous, exactly 65 million years ago. This date has been considered one of the evolutionary facts of nature. Since dinosaur fossils have been unearthed on all continents, the timing suggests a global change in the environment, or catastrophe. The extinction of the dinosaurs is a great mystery of paleontology, and there have been dozens of hypotheses for its cause.1 During the past two decades, however, most scientists have come to believe the extinction was caused by an asteroid hitting the Yucatán Peninsula of Mexico. The precise timing of extinction, in so many locations, suggests it was not a coincidence, so the evolutionary scenario must be correct. Such precision of events has likely caused many Christians to shift their thinking toward ‘old earth’ ideas. But now we have a solid report that many dinosaurs survived the asteroid impact and lived another 1 million years—close to the impact site! In a new volume dedicated to impacts just published by the Geological Society of America, it appears that James Fassett has incontrovertible evidence that dinosaurs existed during the Paleocene (within the evolutionary scenario).2 Fassett has spent many years studying the Ojo Alamo Formation in the San Juan Basin of north-western New Mexico. He has long advocated that dinosaurs lived beyond the Cretaceous/Tertiary (K/T) boundary and into the Paleocene. I get the impression that few have believed him, but now he appears to have collected enough solid evidence. The thought of Paleocene dinosaurs is quite heretical and has implications beyond the issue of the extinction of the dinosaurs. What is Fassett’s impressive evidence? The first is the finding of 34 skeletal elements of a single hadrosaur in the Paleocene. Reworking, usually by streams and rivers, has always been invoked to explain away dinosaur bones in Tertiary sediments. However, one cannot explain 34 bones, of one dinosaur at a single location, as due to reworking, since reworking spreads the bones over a wide area. These 34 dinosaur bones are strong evidence for in-situ burial. Second, Fassett and colleagues performed geochemical studies on various fossils from the Cretaceous and Paleocene layers and found distinctive chemical differences between the fossils from the two periods, especially with the amount of uranium uptake in the bones. This indicates that the dinosaur bones in the Ojo Alamo Formation were not reworked. Third, a number of dinosaur bones are quite large, including one hadrosaur femur that was 1.1 m long with a silicified weight of 130 kg. Reworking is unlikely with such large bones, and there does not appear to be evidence of abrasion, as one would expect on reworked bones. So, the data appear solid for Paleocene dinosaurs within the evolutionary paradigm. One possible way to discard these Paleocene dinosaurs is to move the K/T boundary upward into what is considered Paleocene strata, and many have tried this. However, Fassett and colleagues show that one cannot move the boundary upward without doing violence to set definitions for formations and other evolutionary scenarios. The Ojo Alamo Formation is a very controversial and heterogeneous formation. It is composed primarily of sandstone but includes many types of sedimentary rock, ranging from conglomerate to shale that interfinger, interbed, and change facies frequently. The formation was at first dated Cretaceous simply because of its dinosaur index fossils, but Reeside found fragmentary Paleocene plant fossils.3 Fassett and colleagues also discovered Paleocene plant pollen at a number of locations, including below many of the dinosaur fossils. They have even found Paleocene pollen in the underlying ‘Cretaceous’ formation at two locations.4 The Cretaceous Kirkland Formation is fine-grained and quite different from the overlying Ojo Alamo Formation. The differences are significant enough that the two formations must be separated based upon the lithological definitions required by the North American Commission on Stratigraphic Nomenclature. 5 If the K/T boundary is moved up or down, it would violate one of the definitions for a formation. It is unlikely that a lithological unconformity, or a gap of millions of years, exists between the two formations. This is indicated by Fassett and colleagues’ change in placement of the unconformity after they decided that most of the dinosaur bones at the Pot Mesa site were in the lower Cretaceous formation. These bones were at first believed to be from the Paleocene, and then switched to the Cretaceous. The unconformity was first drawn below these dinosaur bones, in the first interpretation, but above most of the dinosaur bones in the latter interpretation.7 The switching of vertical location for this unconformity indicates that there is no real lithological unconformity, but that the ‘unconformity’ is based on fossils. One can then ask the question of how come there is little or no sign of erosion between the formations if there is a 6 million year hiatus? The existence of Paleocene dinosaurs in New Mexico brings up a number of new evolutionary problems. First, it was not just one species of dinosaur that was lucky enough to survive the impact but quite a number of different types of dinosaurs that are found in the early Paleocene. These include, besides hadrosaurs, Tyrannosaurus rex, Albertasaurus, and Ankylosaurus. So by chance one species could have made it through the extinction, but many species? Second, the dinosaurs are said to have survived for one million years after the K/T! If this were the case, they should have spread all over the world and been found in early Paleocene sediments. Why aren’ t they found in other Tertiary locations? The answer to this will be provided in the next section. Model of a Tsintaosaur—Tsintaosaurs are a sub-group of the hadrosaurs. A femur of a hadrosaur was one of the fossils found in the Paleocene rock. (Gr. hadros ‘bulky, stout, strong, powerful’ + Gr. 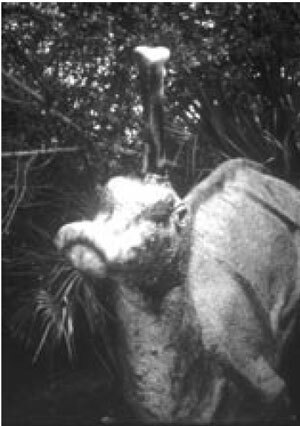 sauros ‘lizard’). Third, how would all the surviving types of dinosaurs go extinct after one million years? There is no catastrophe that the evolutionists can point to for this extinction. The dinosaurs were well adapted to a number of environments and had supposedly lived for many millions of years. There does not appear to be any evolutionary event that would stop them from living clear to the present day. The reinforcement syndrome is the tendency wherein a hypothesis, or result, is repeatedly reinforced by further data, especially if the hypothesis has been developed by a respected scientist. There are many ways of making data agree with preconceived ideas. Once the idea becomes engrained into science, it is very difficult to dislodge it according to the idea of ruling paradigms developed by Thomas Kuhn.11 The reinforcement syndrome is a form of circular reasoning, and it is very common in experimental and historical science.12 It is especially a problem in the so-called historical sciences since these ideas became established in the 1800s for other than scientific reasons and have been reinforced ever since by social and personal factors. There are quite a few blatant examples of the reinforcement syndrome in the literature. Norman Watkins, an evolutionary scientist, first used the term to complain how the dates of magnetic polarity excursions were frequently massaged so that they occurred at similar times. The four-ice-age story of the Pleistocene glaciations was verified from data all over the world for 60 years, but this story is now considered wrong by uniformitarian scientists. The reinforcement syndrome is demonstrated with pre-Pleistocene ‘ice ages,’ which are supposed ice ages lasting for millions of years during certain periods of geological time, going back to more than 2 billion years ago.10 At first, the ‘Permian ice age ’ was reinforced throughout the Southern Hemisphere and then found at various localities in the Northern Hemisphere. However, the Northern Hemisphere locations conflicted with other data of warmth, so they were eliminated. Ancient ice ages were also postulated for all geological periods at one time. Since most of geological time is considered times of warmth, it became embarrassing. So, scientists neatly re-dated all these ice ages into about four major pre-Pleistocene periods. Practically all the lay public, and most scientists, are not aware of the dominance of the reinforcement syndrome in the historical sciences. The evolutionary scenario thus looks well supported and verified by as much data and dates, from as many dating methods that agree with the timing of events. The reinforcement syndrome and the flexibility of the paleomagnetic timescale to accommodate any presumed date was also demonstrated, unintentionally, by Fassett and colleagues, during their research in the San Juan Basin.19 Dinosaurs are supposed to have died out during paleomagnetic Chron C29r, the 29th reversal going backward in time from the present. When a thin interval of reversed magnetic polarity was discovered in the lowermost part of the Ojo Alamo Formation and the top of the Kirkland Formation, it was assumed to be Chron C29r of the Cretaceous. Why was this chron chosen? It was because the extinction of the dinosaurs was assumed in the lower Ojo Alamo Formation. Since Fassett and colleagues believe there is a 6 million year ‘unconformity’ at the boundary of these formations, the reversed interval in the Cretaceous Kirkland Formation is now claimed to be C32r, a reversal significantly older. What is the basis for this selection? Simply the different assumed dates of the top of the Kirkland Formation. Paleomagnitism is really not an independent dating method; it depends upon other preconceived ideas. Chrons are selected by the reinforcement syndrome. One wonders how reliable are the actual measurements of reversed and normal polarity. For example, Chron C29n was found to lie above C29r in the Ojo Alamo Formation. However, Fassett and colleagues claim that Chron 29n was not caused by a normal polarity event in the early Paleocene but instead is an overprint from the present normal field. The ‘primary’ polarity of rocks is deduced by two main methods of ‘cleaning’ what is believed to be secondary magnetism. This secondary magnetism is attributed to subsequent polarity events, especially the modern magnetic field. This incident makes one skeptical of the cleaning procedures, since they seem subjective and open to the reinforcement syndrome. The above is all within the uniformitarian and evolutionary paradigm. There is abundant evidence that the dinosaurs died in the Flood, except those taken aboard the Ark.1 The Ojo Alamo Formation, in particular, does provide some evidence that it also was laid down in the Flood. For instance, the generally coarse-grained Ojo Alamo Formation was deposited on a flat erosion surface.20 How could a flat erosion surface continue to exist after a 6 million years hiatus? This makes no sense, since terrestrial erosion destroys flat surfaces and produces valleys and canyons. During the Flood one would expect formations to be laid on a flat to mostly flat surface or bedding plane from the previous layer. So, the flatness of the underlying surface is more favorable to the Flood paradigm. The character of the sandstone grains that make up the majority of the formation also indicates rapid deposition. The grains are arkose, a feldspathic sandstone. Feldspar weathers and disappears rapidly, so arkose is a sign of rapid erosion and deposition.21 Arkosic sandstone is consistent with a Flood origin and not slow deposition over millions of years. 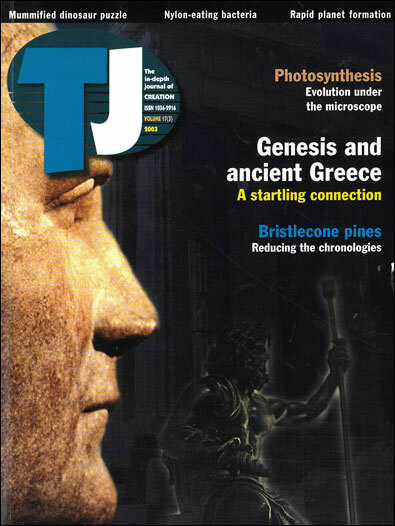 Oard, M.J., The extinction of the dinosaurs, TJ 11(2):137–154, 1997. Return to text. Fassett, J.E., Zielinski, R.A. and Budahn, J.R., Dinosaurs that did not die: evidence for Paleocene dinosaurs in the Ojo Alamo sandstone, San Juan Basin, New Mexico; in: Koeberl, C. and MacLeod, K.G. (Eds. ), Catastrophic Events and Mass Extinctions: Impacts and Beyond, Geological Society of America special paper 356, pp. 307–336, 2002. Return to text. Fassett et al., Ref. 2, p. 310. Return to text. Fassett et al., Ref. 2, p. 321. Return to text. Fassett et al., Ref. 2, p. 314. Return to text. Fassett et al., Ref. 2, pp. 314–315. Return to text. Fassett et al., Ref. 2, Figure 17, p. 326. Return to text. Fassett et al., Ref 2, p. 333. Return to text. Morgan, J., Warner, M. and Grieve, R., Geophysical constraints on the size and structure of the Chicxulub impact crater; in: Koeberl, C. and MacLeod, K.G. (Eds. ), Catastrophic Events and Mass Extinctions: Impacts and Beyond, Geological Society of America special paper 356, pp. 39–46, 2002. Return to text. Oard, M.J., Ancient Ice Ages or Gigantic Submarine Slides, Creation Research Society Monograph No. 6, pp. 11–17, 1997. Return to text. Kuhn, T.S., The Structure of Scientific Revolutions, 2nd edition, University of Chicago Press, Chicago, 1962. Return to text. Watkins, N.D., Geomagnetic polarity events and the problem of ‘the reinforcement syndrome,’ Comments on Earth Sciences and Geophysics 2:38, 1971. Return to text. Cousins, R., Breton, G., Fournier, R. and Watt, J.-P., Dinosaur egglaying and nesting in France; in: Carpenter, K., Hirsch, K.F. and Horner, J.R. (Eds. ), Dinosaur Eggs and Babies, Cambridge University Press, London, p. 57, 1994. Return to text. Sahni, A., Tandon, S.K., Jolly, A., Bajpai, S., Sood, A. and Srinivasan, S., Upper Cretaceous dinosaur eggs and nesting sites from the Deccan volcano-sedimentary province of peninsular India; in: Carpenter, K., Hirsch, K.F. and Horner, J.R. (Eds. ), Dinosaur Eggs and Babies, Cambridge University Press, London, p. 208, 1994. Return to text. Oard, Ref. 1, p. 148. Return to text. Lockley, M.G., Ritts, B.D. and Leonardi, G., Mammal track assemblages from the Early Tertiary of China, Peru, Europe and North America, Palaios 14:398–404, 1999. Return to text. Oard, M.J., End-Mesozoic extinction of dinosaurs partly based on circular reasoning, TJ 15(2):6–7, 2001. Return to text. Fassett et al., Ref. 2, p. 331. Return to text. Fassett et al., Ref. 2, p. 312. Return to text. Pettijohn, F.J., Sedimentary Rocks, 3rd edition, Harper & Row, New York, pp. 213–219, 1975. Return to text.